Gands inhabit a world also known as Gand. They are a short, humanoid species identified in part by their hands with three fingers and their durable exoskeleton. The Gand physiology remains largely a mystery to xenobiologists—nearly a dozen different physical varieties exist within the same species. The world's ecology is extremely inhospitable for other humanoid species because of the giant ammonia clouds that fill the atmosphere. Gands, however, do not breathe as humans do. Most Gands do not breathe at all. They produce gases in their bodies by ingesting food and passing waste gases through their powerful exoskeletons. Some Gands, though, do breathe, but they take in only ammonia, and when offplanet, these Gands must wear a special suit outfitted with a breathing apparatus that supplies them with the gas in specifically regulated amounts. Scientists do not know if this Gand race is an older variation of the nonbreathing variety, or if it is simply another coexisting race. And as Gands do not readily share information about themselves, it is unlikely that any new information will become available in the near future. For most of the Gand species, only a minimal amount of sleep is required to keep them functioning normally. As this is common throughout the Gand varieties, scientists believe this may be a result of culture rather than breeding. The planet Gand's most notable export is the skills of its findsmen. Findsmen are religious hunters who locate their prey by divining omens sent to them in the course of arcane rituals. While many offworlders disavow the power of the findsmen's rituals, their accuracy can be unsettling to the casual observer. Some findsmen sects require that their pupils go through chemical baths or genetic tampering to cause knoblike growths to appear on their chitinous exoskeletons. Findsmen use these four-to-five-centimeter growths as weapons in hand-to-hand combat. Throughout the galaxy, findsmen are hired as security advisers, bodyguards, bounty hunters, investigators, and assassins. The Gands are considered by most offworlders to be the most humble of people. This is because Gand culture demands that an individual's identity be earned. Thus, Gands are soft-spoken and polite. They refer to themselves only in the third person, and then, depending on what status they've earned, they may or may not refer to themselves by name. A Gand who has reached only the first Level of status would refer to himself as simply "Gand." Once a Gand achieves a major accomplishment in life, either at home or abroad, that individual may use the family name. Only when a Gand has become a master of some skill or achieved high praise or recognition may she finally use her first name. Gands rarely refer to themselves in first person. Only those who have accomplished the greatest feats of heroism or who have completed extremely difficult tasks may use self-identifying pronouns such as I or me. Doing so presumes that one is so great that everyone knows one's name. If Gands believe they have acted wrongly, they feel it reduces any accomplishments they have made in their lives. When this happens, they use "name reduction" to show penitence. For example, a Gand who previously has earned the right to the family name might revert to the use of "Gand." There have been very few cases of Gands who have committed such unspeakable acts that they actually leave the society entirely. When this happens, they must discard their culture, and their culture discards them. After this, they may refer to themselves any way they wish. A criminal psychiatrist named Gawynn Karastee analyzed one such Gand who was incarcerated in a penal facility on Coruscant. "The Gand known as Zuckuss is clearly schizophrenic and exhibits multiple personality disorder. In my presence, he has displayed two distinct personalities, one being the lawful, moral, and traditional findsman one would expect when encountering a Gand. He is confident, refers to himself in the third person, and discusses with absolute gravity the nature of his work in religious and philosophical terms." "The other personality is amoral, untraditional, and extremely violent. He exhibits signs of extreme insecurity and refers to himself in the first person, speaking in a dialect similar to that of many Corellian humans. He indicates that he is no longer a member of Gand society and is no longer bound by its rules. He rarely refers to religion at all, avoiding the topic by changing the subject. Through my interviews with Zuckuss, I've come to find that he is suffering from extreme guilt related to his role as a findsman. It seems to me that his primary personality is the one that is insecure, and he's trying to make up for his failings by exhibiting signs of the confident findsman figure. The insecure personality surfaces more often, stating that he "just didn't cut it." The extreme pressure of some situation drove him over the edge, causing him to flee home. There have been reports that for many Gands, failure to become a findsman is reason enough to abandon their culture. 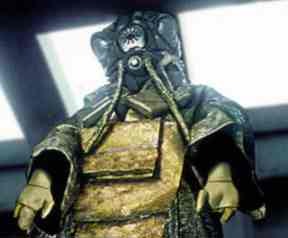 To make up for his own failure, Zuckuss's findsman personality surfaces when he is feeling most insecure. Zuckuss is dangerous to himself and others." Non-Gands are rarely, if ever, welcomed on the planet Gand. Offworlders usually get no closer than one of the orbiting space stations. If they are allowed on the surface, they must remain in a specified area called the Alien Quarters, centered in the spaceports. The very few who have been allowed into the culture itself have done so under the sponsorship of janwuine—a person of greatness—or the ruetsavii—the ruling councils. A sponsored non-Gand would be accepted into society as hinwuine—a being of standing. Scientists have tried to interview some of the hinwuine, but have failed.